I’ve been making my way through books that make me laugh as a method to de-stress from the hectic months ahead. Some of the books I’ve read recently have come as a surprise, some I heard about en route home listening to NPR, but for October, my aim has been to laugh because, why not? I really think I deserve it. I also read some realistic fiction from visiting author Wendelin Van Draanen and caught up with Jordan Sonnenblick’s newest title. But first, the humor. Scholastic sent a box of advance reader copies and one of the galleys caught the attention of a mom who brings her youngest son to our library every day before he goes to preschool. She noticed the author and commented about how funny his other book was, and that had me curious: how could she know about a book in advance of the advance reader copy? Turns out, she’d been following Scholastic and bought the book from abroad seeing as author Aaron Blabey’s The Bad Guys book 1 was such a hit with her sons. She was so excited, we dug through the box looking for his book, which she hoped would be the third in the series. Sadly, it turned out to be book one which she’d already read but she said I’d be in for a treat. The Bad Guys by Aaron Blabey tells of a wolf trying to enlist other fearsome animals to reform and do good deeds in the world. In addition to the (big bad) wolf, there’s also a shark, piranha and snake. They warm up to goodness by trying to save a cat stuck in a tree (it doesn’t go well). After that feat, their next attempt is to free all the dogs locked up inside a prison/pound. The writing is nothing short of hilarious and the illustrations really add to what’s happening in the story. Typically, my barometer of when a book is funny is when I can’t keep a straight face reading it out loud. As soon as the kids see me laugh, they start too and I really enjoy hearing them do this (especially one student who has the most delightful belly chuckle). Sadly, the book won’t come out until January 2017 but it is one guaranteed to engage even the most reluctant reader. I recommend it for grades 2 and up (and secretly wish Scholastic would release the box set all at once in January). 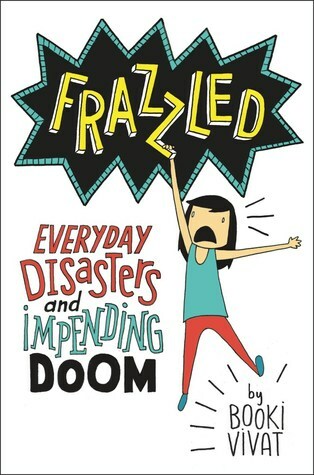 When I first saw the cover for Booki Viviat’s Frazzled, I thought it looked interesting, but I never had a chance to really focus on it. On the long drive home one day, NPR happened to feature her for a segment, and I learned her book was written for middle schoolers with a surprise twist at the end, and I knew I had to read it. True to the interview, the book is written with the most insightful perspective from Abby Wu, who lives in a state of impending doom. I read the first few chapters during the looooonnng waiting period of the debate tournament and it had me chuckling with both the words and the illustrations. A strict mom is depicted as a “momster” complete with fire breath. Abby Wu draws out her imagined lunch tray versus her real lunch tray and moans, “There must be a mistake!” This is a great first book from Viviat, and readers (myself included) will surely clamor for more. I recommend this book for grades 4 and up. In my sadness over the end of Mo Williams’ Elephant and Piggie series, I’ve since learned that there’s a set of “Elephant and Piggie Like Reading” books that encourage young readers (#eplr). Laurie Keller’s, We Are Growing is part of the new series, as is Dan Santat’s, The Cookie Fiasco. There are more slated to be released which is wonderful news, but they lack the togetherness and twosome-ness of the Elephant and Piggie duo. Enter Ben Clanton’s A Narwhal and Jelly Book! 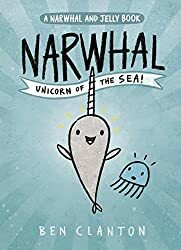 Book one, Narwhal Unicorn of the Sea, features the sunny Narwhal swimming through the ocean only to meet Jellyfish who has NO idea what a narwhal is. That’s ok because they get to know one another, and after what looks to be a rocky start (prove you’re real, no you! ), the two become fast friends. It’s a terrific book and Clanton’s illustrations are delightful. He writes about the making of the series if you care to read about it. (You do). I thought it was refreshing to share a graphic novel aloud and am eagerly awaiting book two in the series. Super Narwhal and Jelly Jolt comes out in May which, coincidence, is the month of my birthday! I like the book so much, I may be dressing up as a narwhal for Halloween…more on that when it comes. I recommend this for grades 1 and above and think the last chapter is the best. The chapter with the kung-fu waffle is a pretty close second. Speaking of which, you’ve been warned: If you’ll be reading Narwhal Unicorn of the Sea, you may get cravings for waffles afterwards. Honest. I’d agreed to a series of book talks and was set to remind students about this when I realized: if I was going to put it out there for my students, I should try and adhere to it too. 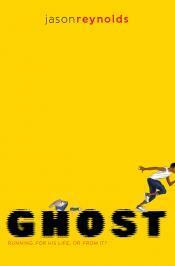 I picked up Ghost by Jason Reynolds because I didn’t know much about track and field and running. I’d been doing a lot of reading of realistic books and I thought I should challenge myself, broaden the span of my interests and I’m so, so I happy that I did. A quick note: this was a book I tried via Audible. In addition to wanting to read and blog more this year, I realized I’d be able to do one, but the other would be a little more difficult. I’d been reading over the weekend for pleasure, but with all the driving I do, it made it hard to stop and pause mid-way through the book when what I really wanted to do was to keep reading. What’s more, my weekend reading times were often lost when I visited the family for our get-togethers. I put the two challenges together and thought, why don’t I try listening to books on my commute? Sure enough, I troubleshooted my problem. Back to Ghost. I book talked it after listening to it via Audible and mentioned to the students how desperately I was rooting for the main character, Ghost. A poor decision maker, Ghost gets into fights, is ashamed of his neighborhood, steals and lies about stealing and somehow, still manages to face each day with humor and a hotshot attitude. It’s that attitude that gets him on the track team. Sitting on the sidelines watching runners practice one day, he strolls on up to the line as runners are getting ready to run, and races along with them. Soon, he’s part of a team and shares with his teammates a dark secret about why he’s a runner. The ending of the book, like some of the others, has me wanting more and I really hope to reunite with Ghost soon and see if I can continue cheering him on. I think middle school students who enjoy sports would appreciate this title. 4th grade me would’ve appreciated this book. Finally, my two realistic reads are both from authors I’ve enjoyed and admired over the years. 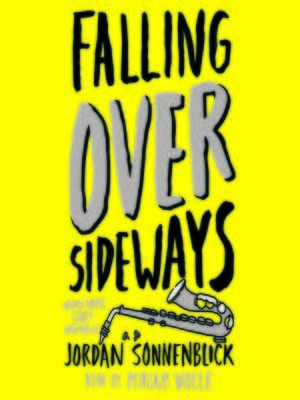 Jordan Sonnenblick has a new title out, Falling Over Sideways. It’s a story from 7th grader Claire as she works her way through middle school. Her best friends are fading away to an advance class in ballet, the kid she thought was an ally in elementary school keeps being mean to her, and she has to continue to be compared to her perfect older brother. Just when things couldn’t get any worse, they do: her dad suffers a stroke and she’s the one that has to accompany him to the hospital. When he leaves the hospital, things are not quite the same with him back home. I’ve continually said that this is a book that I would’ve appreciated as a kid. My dad had a mild heart attack when I was in the fourth grade and I really would’ve liked reading about a strong character facing the same or similar struggle. Plus, there’s a chapter rather early on where Claire talks about her girl issues that is so spot on. What really had me appreciative is how Claire pushes her dad to be more like himself, to work to get better. The last lines of the book had me tearing up, in a good way. Jordan Sonnenblick is an author that should never stop writing, and I’ve recommended his books over the years to anyone I can. I say grades 5 and up would like his work. Adults, too. Creative writing for the win. Author Wendelin Van Draanen is visiting MJS this November, so I had to catch up with her newest book, The Secret Life of Lincoln Jones. I’ve introduced her Shredderman book to 3rd and 4th grade students, letting them know that I shared it with 4th and 3rd graders some years ago because I was so impressed the kid in the story is actually using technology! In The Secret Life of Lincoln Jones, we have Lincoln, hiding his life from his new school mates. See, Lincoln has to stay with mom after school in an old folks home, where his mom works as a caregiver. The folks there are sometimes ornery and have faulty memories, and Lincoln is embarrassed he has to be there. He spends his time making up stories and writing them down in his journal until the ever curious Kandi Kain catches him and helps him focus on the people around him. There are both laughable moments in this book (zombie in a wheelchair!) as there are touching moments that brought me to tears (when Lincoln witnesses two deaths). The neighbor who lives next door to Lincoln is grounds for discussion on a great number of topics and Van Draanen doesn’t sugar coat things when she writes about domestic abuse (which I’m noticing more authors are addressing). It’s a change from her mysteries and her other stand alone titles and I can’t wait to meet her to talk more about Lincoln and how his story came about. What are you reading? What have you read? 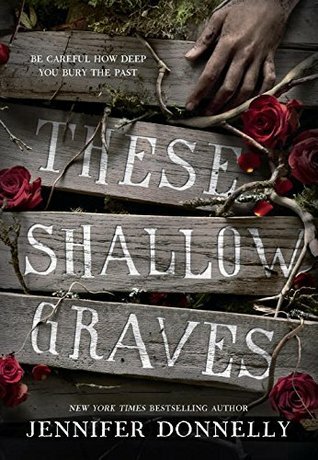 This entry was posted in author crushes, Book recommendations, currently reading on October 19, 2016 by ying. There were so many wonderful books that I read over the summer and was eager to share with students. Below is a short list of the titles that really captured and engaged them on their first week back at school. Not only do we have to get ready for school, but imagine if a school came to life and had to understand what it’s like to begin that very important first day of school. The winner of the 2016 Newbery Medal, this is a wonderful book to share about the power of positivity, diversity, and treating everyone with kindness. Ada Marie is endlessly curious and wants to learn more about the world around her. A great tie-in for our new D-Lab and all the creations soon to be undertaken, students recognized characters from Beaty’s other titles (Ida Peck, architect. Rosie Revere, engineer). Back in the days when people wrote letters and mailed them out by hand, there was something known as “pen pals.” In this book, our pen pals write to each other in rhyme AND discover something unusual about each other. Written when a student asked the author how a book was made, this book provides a great in-depth look at the book creation process (idea, collaboration, printing, shipping, reading) and has students separate fact from fiction. A wonderful non-fiction title that shows a world of PINK animals, you’ll be amazed at some of the creatures that sport pink in nature. This entry was posted in Book recommendations, library on September 9, 2016 by ying. …and I found myself with a tickle in my throat. The tickle shifted to a cough, then to a sniffle, and by the time the First Day of School rolled around, I was full on Sick. The sick shifted into pneumonia and just when I thought I had recovered, it morphed into a chest infection. So, for most of September, I was in bed, tired, droopy and coughing something awful. The saving grace was: I got to get through a lot of the books on my Pyramid of Priorities. I’m ever so grateful for NetGalley and how they provide advance reader copies of titles soon to be published. The request and download process can take a little patience, but reading books in advance does set me up so when students ask for recommendations, I have fresh titles to offer in addition to older titles I can dust off from the shelves. If I haven’t promoted it enough, NetGalley offers book completely for FREE. Yes FREE. Read more about how it works on my post here. 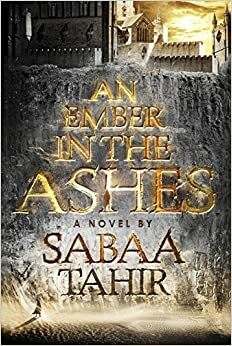 The chapter sampler from NetGalley was so engaging, I had to download the rest of the book and keep reading. Fans of Legend will appreciate the back and forth perspectives, and as such it’s appealing for both genders. But don’t let the comparison fool you because the novel is written on a completely different level. 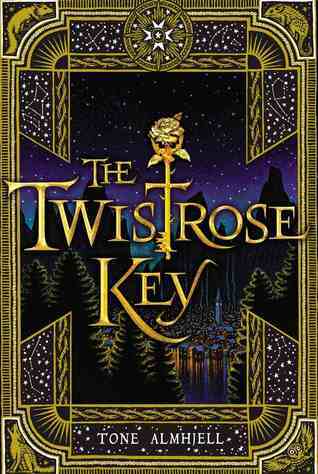 Set in a lush world inspired by ancient Rome, the writing is intense, engrossing and difficult to put down. It is also dark, wickedly so, and best read by those more mature. The Martial Empire’s Blackcliff Military Academy where soldiers train with a mask that melds to their face. (Think an entire academy for Slytherin students). The rebellious spirit of Scholars, the lowest in the Empire—illiterate, poor, enslaved—trying to rise against the Empire. Blackcliff’s top soldier, Elias, trying to defect from the Empire he detests. Laia, a Scholar girl, who has no choice but to become a spy within the Empire for the evil Commandant: known for maiming her slaves as well as anyone dear to them. Book 2, A Torch Against the Night is due out around April, 2016. The cover makes it seem the book is a dark thriller, when it is really more of a murder-mystery set during the turn of the century in New York. Well to do 17 year old Josephine Montfort finds the suicide of her father suspicious and she goes “undercover” to investigate the truth. Remember, this is a time when young ladies are to be prim and proper (when are the not? ), so Jo’s decision to seek the unchaperoned help of a reporter (Eddie Gallagher) and traipse around the city — visiting morgues, going to the docks, visiting bars/brothels and digging up graves — all put her at risk of being publicly exposed or ousted. Donnelly gives readers an amazing amount of attention to detail: you are thrust right into the heart of the city: gritty, dangerous and full of inequalities between the classes. As well, Donnelly offers a thoughtful perspective on how women in that era deftly navigated within limited or constrained roles (the business of matches/weddings). There is a good deal of chemistry between Jo and Eddie leaving one to wonder if their star-crossed love will ever work out. A likable group of supporting characters adds to the story as it unfolds. Recommended by a bookseller who used the phrase, “looking for a challenging book” I approached this novel with both interest and trepidation. 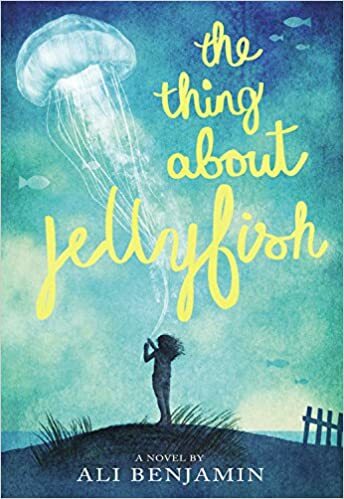 The interest stemmed from my fascination with jellyfish (I can watch them for hours) and the trepidation came from the fact that most reviewers mentioned walking away from reading the book with a box of tissues. True to their word, the book does lead to sentimentality for older adults knowing full well how difficult it can be to survive middle school and all the drama it involves. For main character Suzy, she wants nothing to do with drama and wishes best friend Franny would feel the same. She knows though, that change is coming: in fifth grade the girls start to drift apart, by sixth grade, Franny has become a different person and they are no longer on speaking terms. It’s over the summer before 7th grade, when Suzy learns that Franny has died. Suzy decides not to fill the world with words after Franny dies, which is not the same as refusing to talk. 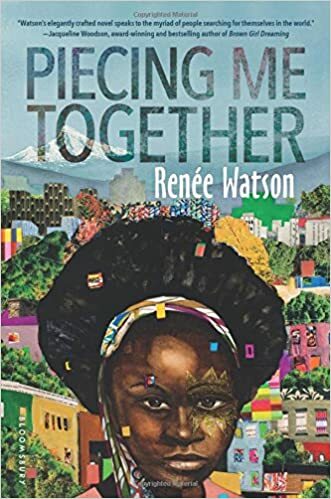 Benjamin does not sugar coat the cruelty that children can inflict, but she does write with grace and beauty and compassionate understanding for what it’s like to endure the changes borne from growing up. There is that one teacher who sees, understands and encourages. My next read is Robert Beatty’s Serafina and the Black Cloak and I think— full on books with brave, daring, strong young women—I’ll turn my attention to books with equally resilient young men. This entry was posted in Book recommendations and tagged book review, currently reading on October 4, 2015 by ms.lin. The 5th graders are always a surprising bunch. During book talks today (is it booktalks or book talks?) they offered reads from fantasy to science fiction to historical fiction. Needless to say, we’ve a diverse bunch of readers, but when a student brought up Erin Hunter’s Warriors series, it made me think back on the type of reader I was at their age. I was a book-mobile-making fiend. I’m pretty sure traditional book reports were put back in play the following year. Yet the variety of stories that students have at their disposal today is astonishing. Hunger Games, Divergent, The Giver. Had I been a student with the release of dystopian books, I have to wonder: would I be capable of a) understanding the material and b) enjoying it? What’s more, when broaching book talks with students who are predisposed to liking books that are popular on the big screen and with topics that toe the line of young adult material, I’m torn between giving them what they want and playing it safe. And so, I research middle grade appropriate dystopian stories: Margaret Peterson Haddix’s Among the Hidden series, the ever controversial The Giver by Lois Lowry, Kate Messner’s excellent recommendation of Crunch by Leslie Connor (about a family that sells bikes in the midst of an oil shortage). Holly Black’s creepy Doll Bones, about 3 children on that edge of childhood and adulthood, who still play with toys, including Queen, a doll containing the bones of a young girl Eleanor who wants to be properly buried back home. Avi’s supernatural The Seer of Shadows, which pits rationality against the magical, and touches on the historical field (a surprise for me) of spirit photography. And Tone Almhjell’s Narnia like Twistrose Key, in which a gal, observing that her house is unusual (frost never melts outside in the flower beds, clocks are always slow within the house), finds a key that opens a door in the cellar into the world of Sylver where beloved pets that have passed on are live and well…facing trolls who threaten the peace in their world. In efforts to try to bring our circulation system a little closer to the 21st century, I’ve made pins on pinterest and hope to include them on the main search screen in Alexandria. If you’re so inclined to find a book in a particular genre (fantasy, mystery, adventure, realistic fiction, fairy tales, sports, historical fiction) look me up, or follow my boards via cathylinmjs. In the way of all things, there’s always so much to talk about (Jordon Sonnenblick’s touching Drums, Girls and Dangerous Pie which I likened to Wonder in terms of feel good endings) and never enough time to just sit down and read. Drop me a line, let’s talk books. This entry was posted in Book recommendations on April 7, 2014 by ms.lin.